Get Adler! Reviews - Caper Games - Award-winning card and board games! "Just finished playing. My 11yo loves the '30s and spy things so he was really excited. He learned the rules and was the 'start' player. We had 5 players: 11yo b, 13yo b, my husband assisted by 7yo g, 9 yo girl, and myself. The rules were clear and concise. Game play was fun and fast. I was Adler and 9yo was Collins. She, unfortunately, was arrested, but I escaped after a confrontation with 2 other players involving escapes on the Tube and Double decker bus with a final shoot out. Made off with RAF and Army documents. Will be a great game to take camping or on picnics." "A solid game that will hit my table repeatedly. It's Guess Who meets hand management. The biggest compliment I can give it is that Tuesday Knight Games would likely publish this game due to it's social interaction, easy learnability, and quick play time." "I have been really enjoying this game! I played it with my brothers (we are basically old men ages 67, 65, 62, and 56). We are all regular game players who play a wide range of board games. The four of us get together once a month for a long "game night" where we usually play 4 or 5 games each night. Just this past week, I introduced Get Adler to my brothers. It was our first game of the night, which I had planned to play once or twice before getting to our more time consuming games. Instead, we played it over and over. Playing the game several times in a row at our age is interesting. For example, I used the Magnifying Glass to look at an opponent’s hand. Then, by the next round, I could not remember what I had seen, or even whose hand I had seen it in! How does it work with younger players? A few days ago, my wife and I had two of our grandsons (ages 9 and 12) play the game with us. They loved it! I had several other games that we were also going to play with them, but they insisted on "one more game of Adler, please." Then of course, after each game, "one more time please, please". So that is the only game we ended up playing! Which was fine with my wife and I because we both enjoy the game as well." After the investigation is where the heart of the game lies and Caper Games brings us a tense, four-round chase befitting the theme. With just four rounds to accomplish their task, everyone feels the pressure mount as the clock ticks down with each card play and it does start to feel like an old school spy film when everyone jumps in! The card matching arrest mechanic is very easy to understand and explain for gamers of all ages. With several different evasion cards available, the Adler player has multiple ways to dodge arrest while drawing more players into the active pursuit, rather than being bored spectators. Again, it’s a thematic and smart way to get more players involved even when it’s not their turn. Game play moves along fairly quickly with any size group, and most games last about 20 minutes on average. If you’re a fan of deduction games like Coup, Werewolf and the like, you should give a look at Get Adler. "Get Adler! is a quick social deduction game. It is easy to learn & very portable. No game of Get Adler! will be the same as the one before it. It is great for a group that loves to play games like One Night Werewolf, Resistance, Avalon, & Coup. 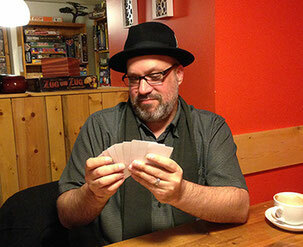 I also think game groups that enjoy playing card games like Love Letter would also like this game." "First off it needs to be said I am not much of a gamer and really will only play Ticket to Ride, Dice Town, and Bang once in a while. At first Get Adler! drew my attention because I like the detective theme, loved Clue when I was younger. Get Adler! was easy for me to learn and kept my interest. The length of each game is perfect for me. I found myself wanting to play it over again. Get Adler! is a great light game." I had the privilege of playing Get Adler at our local gaming shop during a preview event. Our group had 4 games that night. The game starts off with each player getting a secret identity and a hand of seven cards. There is a police ”Bobby” Constable Townsend, MI5 Agent Gold, the Russian Agent Tarasov, Inspector Sharpe, the double agent Adler and his accomplice Kate Collins. The goal of the game is for Adler, with the help of Kate Collins, to make it to the 7th round with at least one secret document card in their hand of cards. Then Adler and his accomplice win. If, for any reason, Adler does not make it to the end of the 7th round with the documents, the law enforcement characters win: Constable Townsend, Agent Gold, Agent Tarasov, and Inspector Sharpe. Each turn the players draw a card, then ether play or discard a card. There are many cards to play and discard: binoculars, guns, disguises, etc. Each card played lets you do something, like look at a players hand, or steal a players card. Playing a question card, you can ask questions, like "do you have green eyes?" This process of asking questions, as well as watching what people play or discard, gives you hints on who the bad guys are. Each round being marked by Big Ben's clock ticking away to 7pm, putting you right in the theme. During these beginning rounds you are trying to build a good hand. The villains need escape cards and secret documents while the heroes want arrest, matching escape, and magnifying glass cards. On the 4th round it becomes a lot of fun because once an arrest attempt is made everyone at the table can join in by matching the escape card the villains play. If the villain escapes then everyone that participated in the arrest can draw back up to your hand size again. If a shoot out happens, then it really gets fast paced since again cards are coming out of your hand quickly. Its really fun and adds some chaos to the game play. On top of that chaos, there are some rare cards like the bomb that affects everyone at the table. On top of that, the accomplice is feeding Adler cards he needs, making a very interesting game. The cards interact with each other in cool ways and there is strategy on when to make an arrest or look at someones cards, etc. At times we were all laughing at the outcome. In one game, Adler shot 2 heroes dead. In another Adler lived for the 7 rounds, just to lose the top-secret document right before he wins. In another, Adler gets away with a top-secret doc. Each game has a story which I find a lot of fun. This is a rough description because there is obviously more to it, but for me personally I cannot wait to play again; and the more I played the more I realized the finer nuances of the game."